First, it's important to note that you do not have to be perfect with your photo alignment. You just want to be fairly close and fairly consistent. 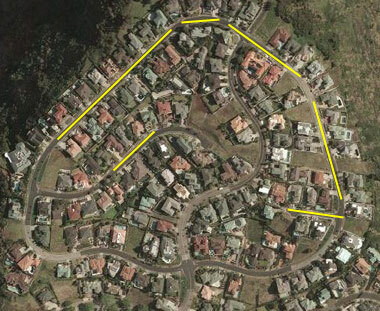 That's part of the power of RealPlaces - you do not need to be super-precise! 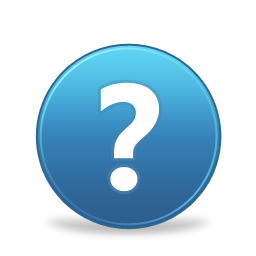 Currently, all spots must consist of exactly 8 photos, which are roughly spaced in equal (45 degree) increments. If the streets or landmarks align with the 8 major compass directions (i.e. N, S, E, W, NE, NW, SE, SW) it's quite easy and natural. But not all places naturally align with the major compass directions, and this page will help you plan for those situations. We have lots of improvements planned, but for now, these tips should help make it easier to create your places. Places which are aligned N/S/E/W like this are easy to work with. Just go for it! Places which are aligned along NW/SE and NE/SW lines also work great. If you start shooting each spot facing the same direction down one of the streets, remember to choose that direction as the "start dir" on the Sort page when you sort your photos. Even if your place has open space with relatively little structure, you're still fine. Just try to keep your spots aligned in "paths" that follow the 8 major compass directions. You have a lot of flexibility when doing this, but practice helps. If you know in advance you're going out to shoot a RealPlaces walkaround, it can also be helpful to bring a map to sketch on. Sometimes your natural landmarks (streets and buildings) are nice and straight, but they are not aligned with the cardinal compass directions. This used to be a very difficult problem, so we added a quick-and-dirty, but functional solution. The UI is rudimentary, but it's easy and it works for now. Here are two examples. In both cases, the yellow lines indicate the major compass directions, and the blue/green lines show the natural orientation of the immediate landscape. • After you have sorted your photos into their respective spots and placed them on the overhead map, picture a line that crosses through a set of your spots. 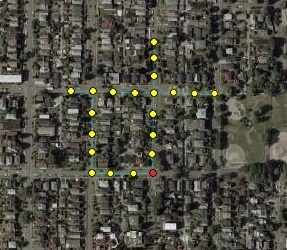 Perhaps there is a street or other landmark to approximate this, or you can even create a temporary link between two spots to give yourself a good visual. • Now compare that line with the closest of a N/S or E/W or NE/SW or NW/SE line, and estimate how many degrees your line is from one of those 4 cardinal compass direction lines. You don't need to be super-accurate, just make it close. • Click the Set Rotation button and enter the number of degrees as a + or - offset, with + being clockwise and - being counter-clockwise. Because you offset from the closest cardinal line, the value you enter should be no more than 22 degrees. Example A: depending on your spot positions, this might be aligned close enough to the main compass directions to work without any adjustments. But to be sure, let's give the system a little help. 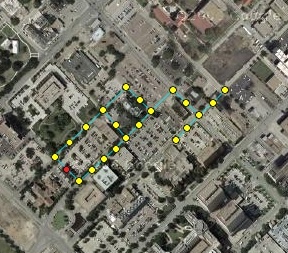 The street (blue line) lines up most closely to the vertical N/S line. How close? It's actually just under 7 degrees, but if you approximate anywhere between 5 and 10 degrees you'll be fine. It's clockwise from the nearest yellow line, so click Set Rotation and enter 7. That's it. 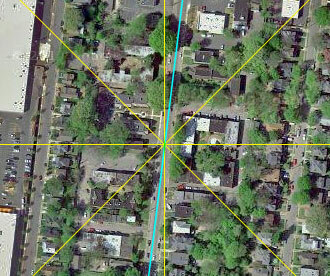 Example B: the angle of the street is almost directly between 2 of the 4 major compass direction lines. Ugh! You'll almost certainly have trouble linking several spots without making a rotation adjustment. 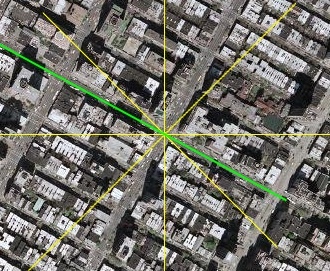 If your spots generally follow the green line, then the closest major directional line is the NW/SE yellow line. You can make a rough estimate that the green line is about 15-20 degrees counter-clockwise from the NW/SE line, so click Set Rotation and enter -17 (counter-clockwise, so negative degrees). Again, you do not need to be precise - just close! What this process does is give hints to the system so links between spots will be created that make sense. Note: You can click the Set Rotation button before or after placing the spots, but you should do so before linking the spots, as any existing links will be removed when the rotation is changed. Lastly, even if your area of interest looks like it was modeled after a plate of cooked spaghetti noodles (below), you may find there are sections which are still straight. Just treat them as separate places and set a rotation offset for each place. If things are extremely twisty you may have difficulties linking more than a small number of spots, but we will be able to handle many arbitrary situations like that in the future. Also, it is not a requirement to link together all spots in a particular Place! You can choose to create your Place with some spots not connected to others. Either individual spots or clumps of spots, it's your choice. If you do this and use our widget don't forget enable the side-by-side map to allow users to click on these spots on the overhead view to visit them! One last note: If you do create multiple Places (like the situation above) that are related and near each other, ask us about linking them together.